1. Get exactly what you want in a landscape design. Once you and your landscape professional decide on a design for your space, you know exactly what you are going to get! There may be small changes along the way, but not without your consent. Therefore, when all is said and done, what you planned, is what you get. Working on your yard is hard work. From the initial installation to the monthly (or bi-monthly or weekly) maintenance, it can be labor intensive even for the simplest of designs. A professional has a reputation to uphold. The quality of their work is imperative to the future of their business. You work hard. You deserve some time to kick up your feet and take it easy. The last thing that you want to worry about, after working all day and all week, is taking care of your yard. 5. You don’t have to worry about purchasing the wrong materials. Time, money, and headaches spared! Get exactly what you need without the stress. This is all in the daily life of a professional landscaper. They know what you need and exactly where to get it. From start to finish, everything is planned out for your project. Certain tasks must be finished before others begin. And that's not even considering the proper permitting and approvals. 7. Work with your weather and climate. Natural climate and weather patterns are going to play a huge role in the care and maintenance of your landscape design. Some plants will do better in a places such as Haiku, while others will thrive in Kihei. Perhaps a rock design for drainage is best for you. A professional will be able to guide you through the best choices for your climate needs, as well as set up the proper care and maintenance schedule for you. They may be able to show you some designs that you had never thought of. A professional will keep up-to-date on new information and new landscaping trends. There is a very good possibility you are going to like what you see. When "Doing-It-Yourself", it is easy to just keep buying more and more. Every trip to Home Depot can send your budget cap higher and higher. When you work with a professional, you give them your budget and they give you a price quote to suit your needs. Ready to contact a professional today? Contact us for a quote today regarding any of your landscaping needs. Space is a commodity. Many places are building up, and apparently taking their landscaping with them. Proper waterproofing measures need to be taken to ensure that no leaks occur. 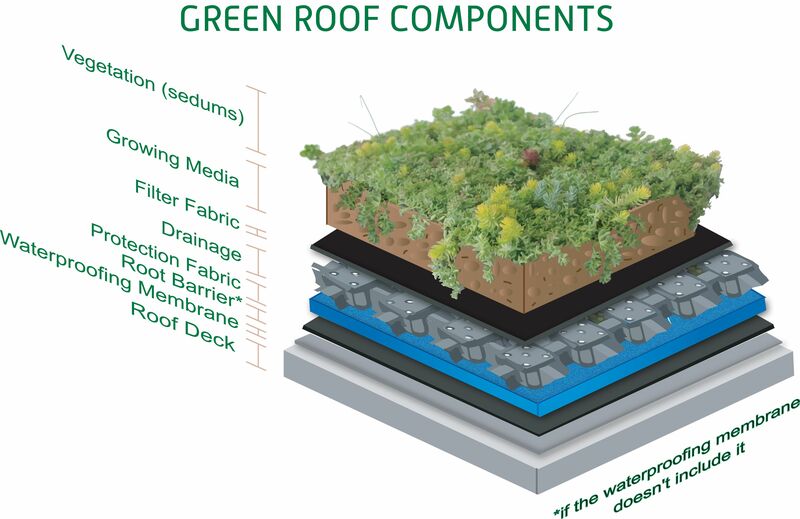 This is the most important aspect of a green roof. Roofs are designed to dispose of water quickly not holding water, as happens with a living roof. Even with this step properly done, plant roots have a way of making their own paths, which could ultimately cause leaking anyways. What is the end use of your rooftop landscape? Are you looking for a garden or an outdoor lounge area? Or perhaps you just want to lower your heating and/or cooling costs. This is an exciting new trend in landscaping. Maybe Hawaii will be next to implement it into our dwellings?